The sacrifice bunt is a crucial, but often overlooked part of the game, and long-time coach Gary Haning talks about how to make it more successful in his latest column for Extra Inning Softball. 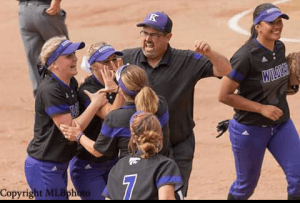 Gary Haning is one of the legends of fastpitch softball and has won over 30 national championships in his more than three decades of coaching, particularly with the powerhouse OC Batbuster organization. Haning was inducted into the NFCA Hall of Fame after winning 30 National Championships in his storied career. “Fellow Olympic star and Women’s College World Series champion Jennie Finch, won a 1997 national crown and had 1998 runner-up finish with the Batbusters as a teammate of her future University of Arizona teammate Toni Mascarenas. Gary also co-founded the hugely-successful Premier Girls Fastpitch (PGF) with Dan Hay and today helps run the PGF Nationals, which recently concluded with over 500 teams and nearly 1,900 total games. We’ve been fortunate to have him write well-received articles in the past including The State of Pitching Today and always look forward to his insights on the game and advice to players and coaches alike on how to improve. Watching and coaching softball for many years, I have often heard people say that softball is a game of inches. This is certainly true but hardly unique in sports and really in life. Football, basketball, hockey, even (yuck) soccer games are often decided by a play that would have a different outcome if the ball and/or the athlete was in a very slightly different position. The difference between winning and losing is doing the small (but critical) things well. The difference between a good or even a great team and a winning team is often a very small margin and almost always the teams that come out on top do so because they do the small things well. As I have watched softball games from 10U through college and even professional and international softball, it is easy to see that in games between somewhat evenly-matched opponents, the team that executes the fundamentals of the game wins. None of this is news and nothing you read here will be secret information that you have not heard before many times, but if you are a new coach or you are looking to improve your team whatever the talent level, an emphasis on the key areas will help.